Significant tax cuts to dramatically grow the economy (well above OMBs projected 2.2% long term GDP growth rate) to outpace the cost of current government programs, and an increase to the Department of Defense. Some people, like conservative radio host Sean Hannity, advocate the Penny Plan. The penny plan calls for reducing one penny out of every dollar that the federal government spends. Over a 5 to 6 year period the budget balances. The devil, however, is always in the details. Specifically how do you reduce one penny out of every dollar that the federal government spends? I spent 10 years building and balancing budgets in the Department of Defense and the details matter. The following list of ideas are the foundation of, and principles upon which, one penny out of every dollar, for example, could be found over six years in order to shrink the federal government, reduce the burden on American taxpayers, and balance the budget! First, and a lynchpin to balancing the budget, the economy must be energized and grown beyond historic growth and current CBO projections of 2.2%. While this is well above the average for the Obama Administration, it isn’t nearly good enough. Growing the economy starts by eliminating laws and regulations that strangle small, medium, and large businesses instead of enabling their expansion and competitiveness. Minimum wage laws, Obama care, energy mandates, and oppressive tax laws, for example, should be repealed outright or dramatically simplified to unshackle America’s economy. Minimum wage laws not only hurt small businesses and entry-level workers, they cost the taxpayers as well since the federal government also pays those higher wages. Obama care is a well-documented job killer, massively expensive and the gateway program to institute socialized medicine. Taxes must be reduced to spur business creation, expansion, and innovation. Letting the American people keep more of their own money is also a moral imperative. We must enact an all the above energy policy and repeal penalties instituted by the Obama administration and the EPA upon nonrenewable sources like coal. Democrat policies drive the costs of energy up, and the federal government uses a lot of it. Cheaper energy means cheaper government. Reducing energy costs results in a net savings not just to the federal government but also to Americans and businesses. With reduced cost comes greater competitiveness, profitability and prosperity both at home and abroad. The United States has enough energy to lead the world for 100+ years. We will need it to balance our budget, pay back our national debt, and posture America for another hundred years of prosperity. Growing the economy is critical, butwe must cut the budget. Freeze hiring on all civilians within the federal government. There could be exceptions made in areas that are considered strategically important, such as the Department of Defense or Customs and Border Patrol, but on the whole the effort would be a freeze to further hiring across the federal government. A slightly less contentious option would be to institute something like a 3 to 1 hiring policy. In this case for every three people who naturally leave the federal government, such as to retire, one civilian hire would be allowed to replace them. This policy would reduce manpower in agencies across the federal government. There are duplication of missions and programs throughout our government. As personnel decline those duplicative organizations, agencies and programs should be collapsed into one another. As the organizations are collapsed into one another, the management overhead should be trimmed as well, effectively cut in half and taken as additional savings. Another benefit of smaller and simpler government is that the oversight and management of government itself becomes less complex, and more effective. The potential for savings and reductions in watchdog organizations like OMB (which oversee the federal government’s budget and budget building process) could be further reduced. The federal government, including the Department of Defense, owns or leases over 361,000 buildings, office spaces, and warehouses, with an annual operating cost of over $33 Billion. Much of this infrastructure is excess to need, and should be sold or disposed of now. As the federal government is reduced through manpower reductions, even more excess office space and facilities will be exposed. Those facilities need to be returned to state and local governments or sold outright to businesses and the American people freeing taxpayers from the burden of maintaining them, paying utilities such as water, electricity, etc. There is significant excess infrastructure and basing across the DOD. The Air Force, for example, constantly states that it has 30% access infrastructure and desperately needs a BRAC in order to cut excess bases down to the proper size to support the diminished Air Force. Done properly, a BRAC could save the Department of Defense billions every year without any adverse impact to our nations military capabilities. There is waste in the Department of Defense when it comes to the military’s energy spending. The Obama administration turned the Department of Defense into a research and development arm of the renewable energy industry. Untold billions of dollars, hidden within the Service budgets, are being spent every year by the Department of Defense on windmills, solar farms, development of renewable biofuels, and testing of biofuels on military equipment from aircraft to ships. Unfortunately biofuels are far more expensive than the fuels they’re replacing. They’ve also proven to be corrosive, contain less energy per pound of fuel than what the replacing, and effectively reduce the range and capabilities of the equipment in which they are used. They increase the cost of maintenance, wear and tear on assets, and decrease the longevity of jet engines and other components such as seals that are exposed to the more corrosive biofuels. All of this R&D should be stopped and the Department of Defense should no longer be used as an experimental arm for the progressive anti-global warming movement. Agencies and programs across the federal government need to be eliminated or drastically reduced. The list includes the EPA, the Education Department, Health and Human Services, the IRS, the Public Broadcasting System, and support for the Federal Reserve as a good start. Tax laws need to be simplified so that businesses can free themselves from the wasted cost of dealing with a tax code that’s become so burdensome no single person can possibly understand it. Reductions of the types listed above would shrink the federal government to the point where Congress could once again manage it. After all, Congress’s prime responsibility is to pass laws including those funding the federal government. They failed year after year to pass budgets because its become far too big and far too complex. With the reduced size comes an increased ability to manage. When Congress is able to properly manage agencies and their budgets further waste, duplication and costs can be found. We commonly hear the term too big to fail. In the case of government it’s failing because its too big. 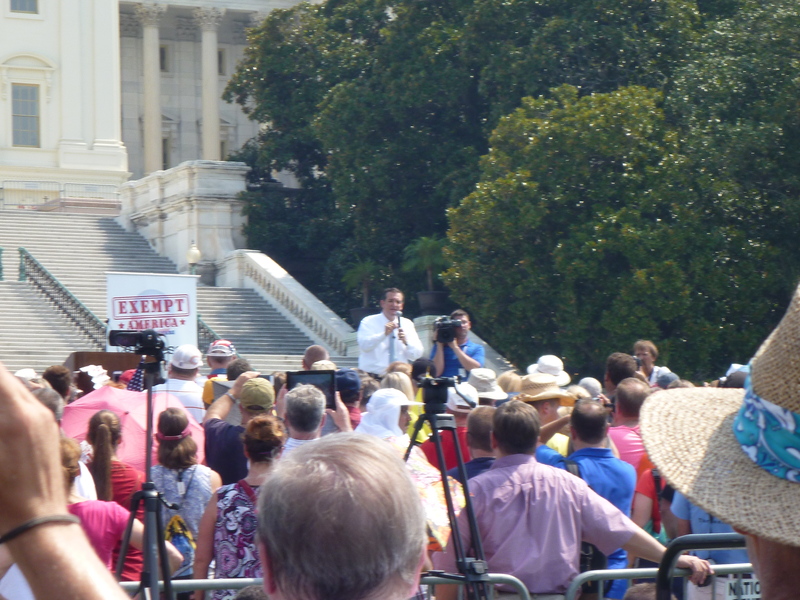 The federal government needs to prioritize its constitutionally mandated responsibilities first. All other missions are secondary and subject to reduction. The border must be sealed! Illegal immigrants who are committing murders, rapes, robberies, dealing drugs, involved in human trafficking, to gang warfare must be caught, jailed or sent back to their home countries for jailing. Penalties must be stepped up as an effective deterrent to these brutal thugs ever returning to the United States. The wall must be built and America’s border controlled. We must significantly reduce the number of illegal aliens, and know who enters and stays within our borders. You wouldn’t let strangers into your house, and we should not let them into our country. Fewer illegal aliens will reduce burdens on local, state and federal governments. The costs to America’s schools and law enforcement alone would be a significant savings. Energy subsidies must be stopped. Let companies and technologies compete on an equal footing. The strong will survive and the inefficient will not. Waste, fraud and abuse of government welfare programs must stop. Welfare should be tied to work for the able minded and able bodied. The goal is to use the social safety net as a temporary support system, not a way of life. Finally, we must reform programs like social security, in order to ensure they exist for the long term. Without reform, costs will continue to eat the budget, and our children will see nothing but the bills. Balancing the budget is a national imperative, and should be codified as a Constitutional Amendment. It wont be easy, and will require courageous politicians with the insight to see, analyze and solve Americas spending problems. No such leadership exists in the Democrat Party. It’s GOP or Bust…literally. 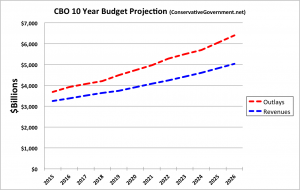 What Are A Dozen CBO Projections for 2016-2026? The following excerpts from the non-partisan Congressional Budget Office (CBO) analysis of the Federal Budget show a dozen projections looming over America’s economic future. CBO expects federal revenues to rise by 4 percent in 2016 to $3.4 trillion, or 18.3 percent of GDP. Beyond the 10-year period, if current laws remained in place, the pressures that had contributed to rising deficits would accelerate and push debt up even more sharply. The likelihood of a fiscal crisis in the United States would increase. Federal spending on interest payments would rise substantially. Interest rates rise from their currently low levels. Mandatory outlays will be $168 billion higher in 2016 than they were last year. The 2016 deficit will be $544 billion, $105 billion more than the deficit recorded last year and is $130 billion higher than the one that the agency (CBO) projected in August 2015. The economy will expand solidly this year and next. Also push up inflation and interest rates. The budget deficit increases modestly through 2018 but then rises more sharply, reaching $1.4 trillion in 2026.NOTE: This is equal to President Obamas worst annual deficit in 2009. He and the Congress put America back on a path that can’t be sustained. The projected cumulative deficit between 2017 and 2026 is $9.4 trillion. Growth in outlays would outstrip growth in the economy, and outlays would rise to 23 percent of GDP by 2026. Almost half of the projected $2.5 trillion increase in total outlays from 2016 to 2026 is for Social Security and Medicare. CBO now projects a cumulative deficit that is $1.5 trillion larger than the $7.0 trillion that the agency projected in August 2015. NOTE: In one year the deficit picture worsened by $1.5 Trillion. The fiscal policies embodied in CBOs baseline would dampen GDP growth in 2017 and 2018. In addition, some aspects of fiscal policy under current law, particularly the Affordable Care Act and real bracket creep, are projected to dampen the supply of labor and therefore the growth of output through 2020. NOTE: As stated by Obama care opponents, the ACA is unaffordable, and driving up health care costs. Potential GDP will expand at an annual average rate of 2.0 percent, a significant slowdown from the average growth of potential output that was observed during the 1980s, 1990s, and early 2000s. NOTE: Marxist/Progressive/Socialist policies of massive government spending don’t work, except to impoverish the nation. The series of slides in this blog are modified from the Congressional Budget Office’s (CBO) February 2014 report “The Budget and Economic Outlook: 2014 to 2024”. The above slide shows federal spending broken out by major spending category. Note the vertical red dotted line showing where we are today. The above slide highlights the growth in Net Interest, an increase of 1.9% of our GDP vs current spending levels. This is the largest area of growth projected in the budget, and is like the interest you pay on you credit card. America’s interest payments are just starting to accelerate, having been masked the last few years by historically low interest rates. If the actual interest rates exceed what CBO projects, roughly 5%, the costs of Net Interest will grow. 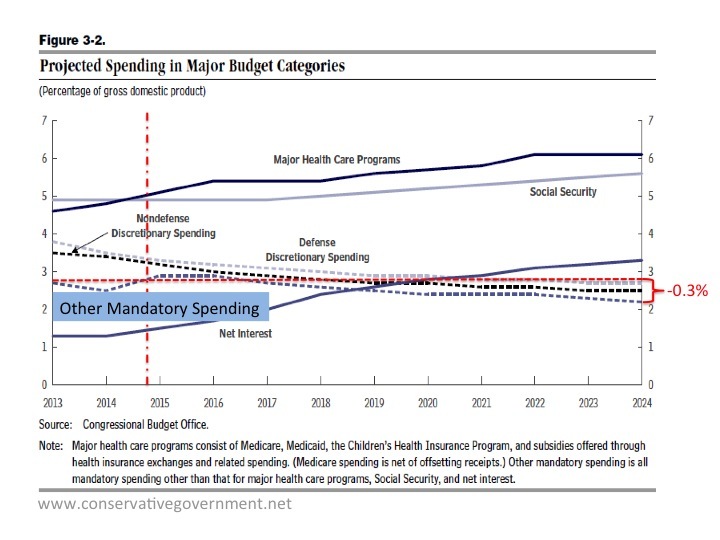 Other Mandatory Spending decreases relative to GDP by -0.3%, and is the only Mandatory Spending category that isn’t protected to consume even greater portions of the GDP. 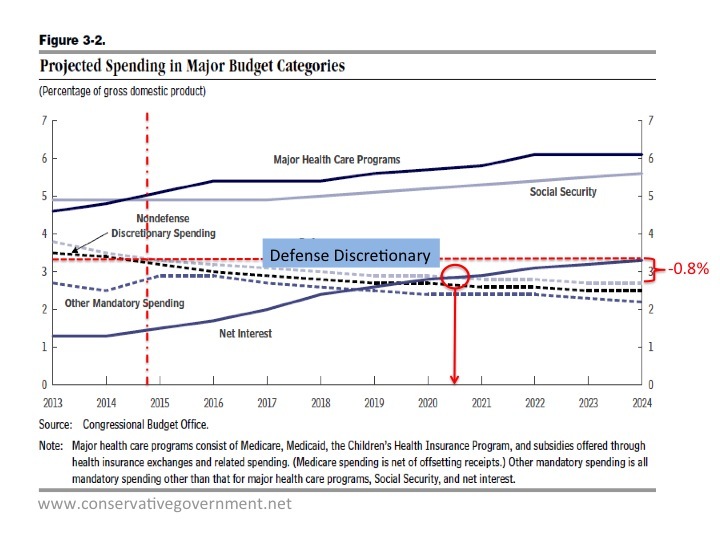 Defense Discretionary, partly due to reductions instituted by Secretary Gates, and partly due to Sequestration, is projected to continue it’s decline relative to GDP. It is projected to drop to levels not seen since the 1930s, and as shown by the red circle and arrow, is projected to drop below interest spending by 2021. 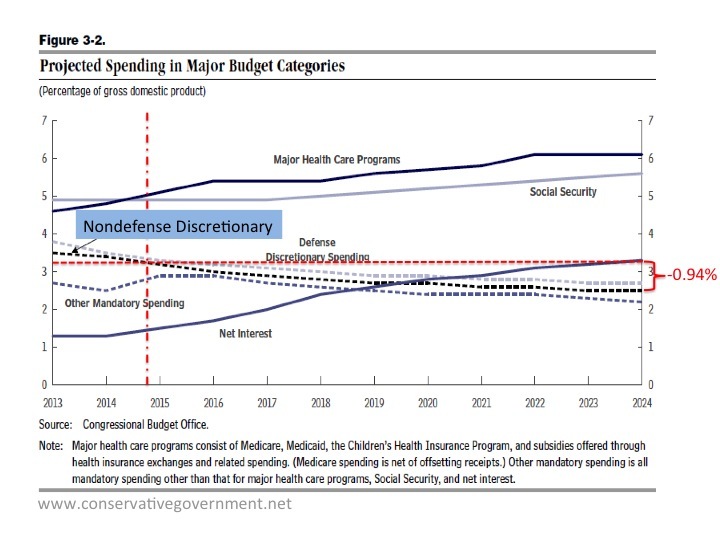 Interest spending is projected to begin dwarfing defense spending there on out. 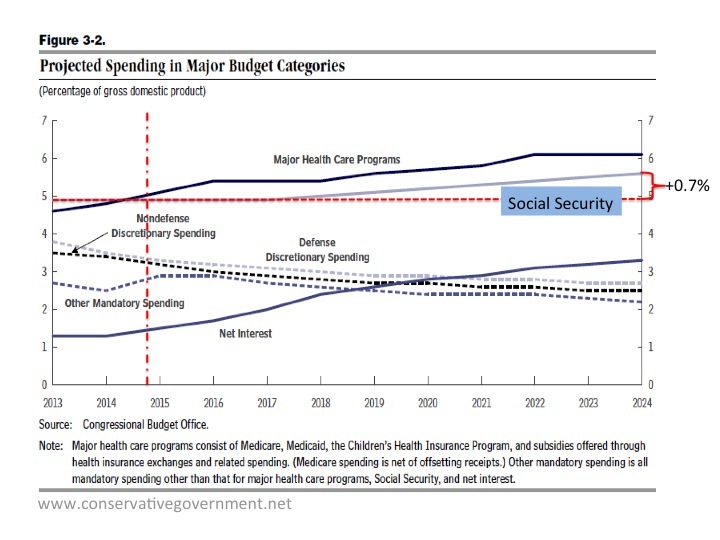 The increased cost of interest, along with health care and social security will dominate federal spending. Social Security, now that the baby boomer retirements are well underway, continues to swell. Reforming it, in order to save the program from pending collapse, is essential. 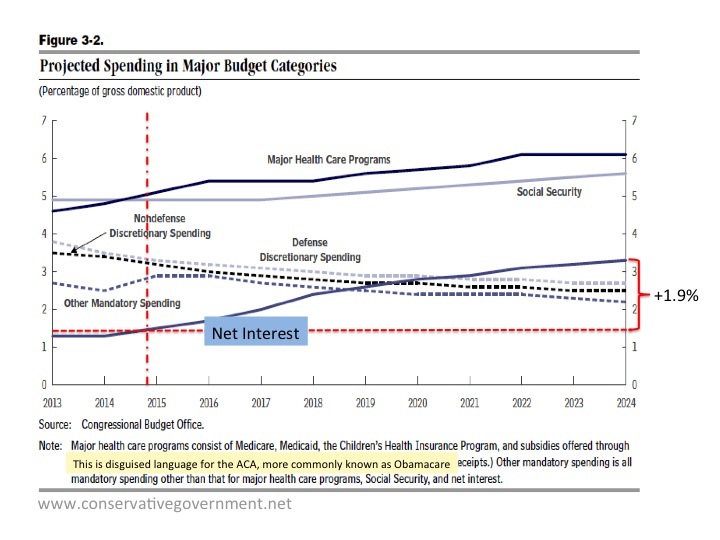 Despite it’s growth of 0.7% relative to GDP, that increase comes in third behind Interest and Health Care spending. 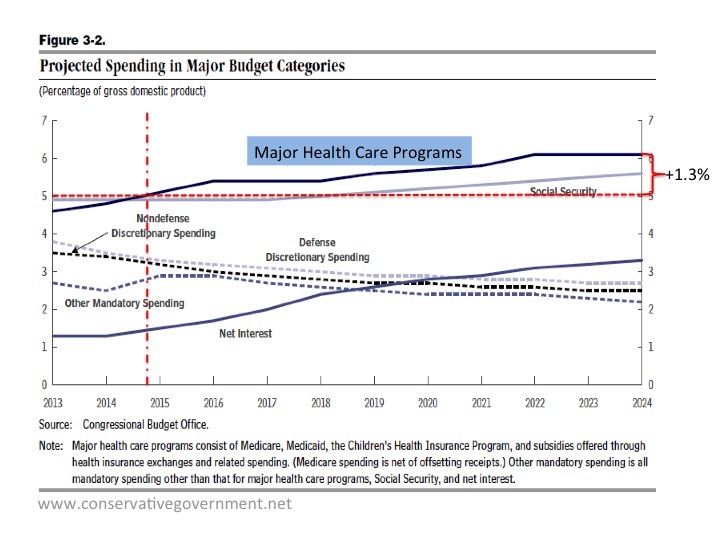 Major Health Care Programs Constitute The Largest Part Of The Federal Budget, Eclipsing Social Security In 2014. 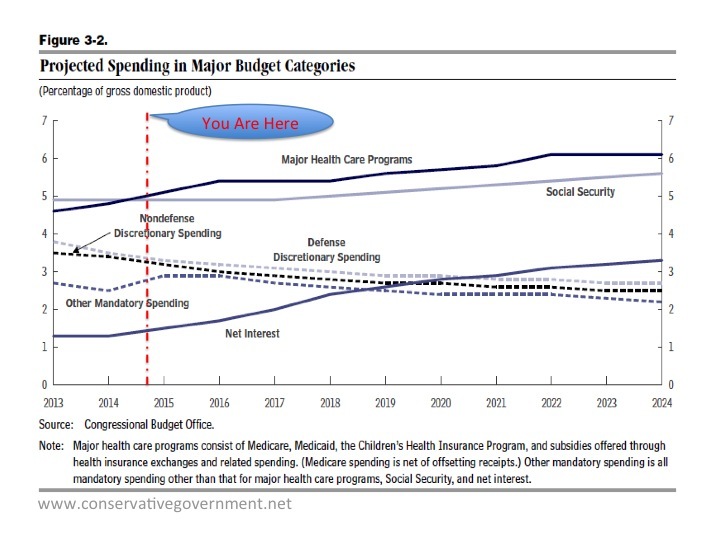 Major Health Care Spending, thanks to the passing of Obama Care, or the “Affordable Care Act” is now the largest part of the federal budget, and is projected to eat an additional 1.3% of America’s GDP by 2024. Combined with Social Security, Interest and Other Mandatory Spending, they are projected to eat 17.2% of GDP. The rest of the federal budget gets the scraps. 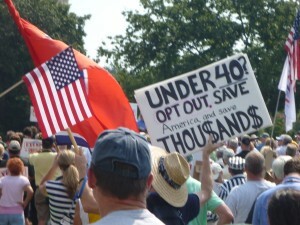 Liberty loving Americans standing against reckless government spending. In July, 2014 the Congressional Budget Office released its latest annual forecast on America’s economic future, “The 2014 Long Term Budget Outlook“. Some key assumptions foretelling how high future interest rates will be on money the federal government, really the American tax payers, must pay are less than inspiring, in fact they are all bad news. These assumptions add to previous depressing CBO assumptions. – The labor force is projected to grow much more slowly than in the past (1990-2007). (Slow labor growth means America’s ability to grow its tax base is weakened). – The share of total income going to high income households will remain higher in the future (i.e. Fewer will share in the “American Dream”). – Total factor productivity will grow slightly more slowly than in the past. (Less productive workers means less products and services). – The risk-premium will probably remain higher than in the last few decades (i.e. Investors will find US Treasuries more attractive since they will be afraid of higher risk investments). – Federal debt, unless things change, will be much larger relative to GDP than it was in the past. Click here for chart of America’s projected federal debt. – Net inflows of capital will be less (i.e. There will be less foreign investment in the United States, which means less growth in businesses). – The capital share of income will remain higher than historic averages (i.e. Those that have money to invest will keep more of the resulting income). – The working population will get older, and have fewer people in their prime savings age (i.e. Less $ will be saved, and less $ will be available for investment). This future isn’t set in stone, fixing it requires real leadership, a long-term commitment to smaller, less intrusive, and more effective government that stops excessive taxation of Americans. Upcoming posts will look at the details within CBO’s numbers.